Many, many, many weeks ago, I approached foxxian about commissioning krechevskoy to color the Master's Pet pic series I have gotten from so far. Thankfully she said yes and this is the result of the first pic he has colored. I can honestly say that foxxian was happy with the end result of this pic and should be happy with the rest of the pics. As with each of the original pics she has done, each of these pics will see Ainoko in different colored silks (and there will be one pic that will have two different version much to the enjoyment of certain people here on FA). As with this pic, I will be reworking the stories that accompany them to try and make them flow better. *Soft, exotic music filled with drums, strings and chimes flows through the room as the pet sways, weaves and moves rhythmically to the gentle beat. His motions are smooth and effortless as he leaps, bounds, and twirls as he seems to weave a story with his lithe, nimble body that is pleasing to ones eye. A warm smile creases his muzzle as he imagines his Master and friends sitting on the assorted cushions, enjoying his performance and the rewards he will get after everyone has left to parts unknown. His ears flicker from the breeze as he slowly spins, his long, fluffy tail wrapping loosely around his body, before falling softly to the floor. He dances like this for hours, perfecting his moves, routines and body, making sure that no matter what dance he performs, whether it is fast or slow, he won't be out of breath. Got this from the sweet, talented and wonderful foxxian I got lucky and managed to get one of her limited sketch commissions and this is the result. I can't express how beautiful this is. 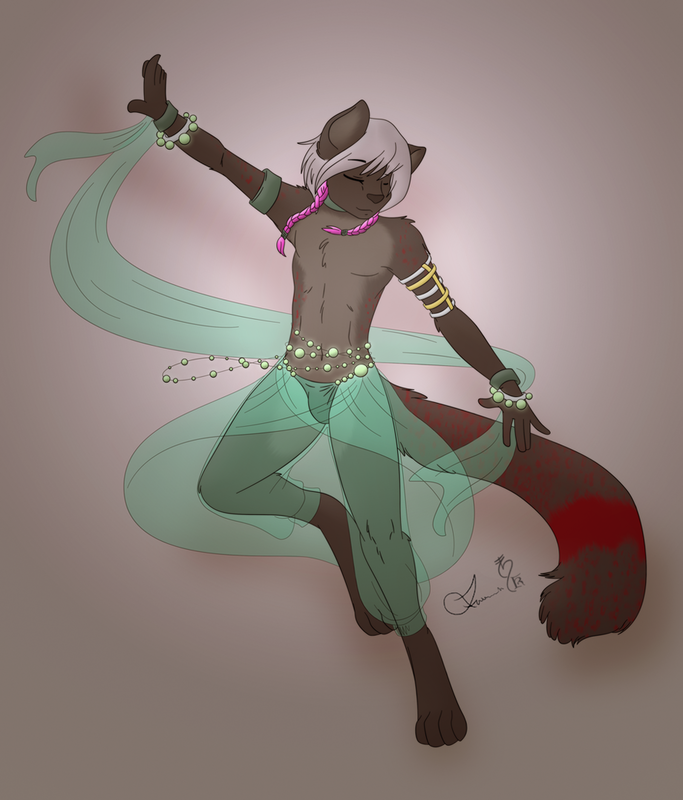 The expression on Ainoko's face as he dances for an unseen audience to music that he can only hear, the grace, the love that is emanating from every move he makes, and the awesome harem clothes he is wearing. foxxian floored me with the beauty of the pic and I couldn't be happier. Marked Mature for the overall sexiness of the pic.